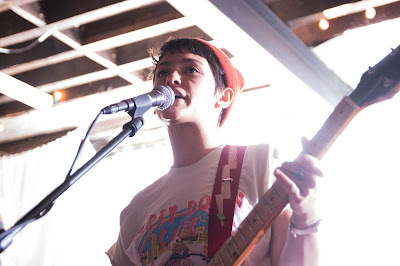 Alex Luciano of Diet Cig. Photo by Macey Norvell. Diet Cig sold out the White Schoolhouse in Lawrence and ushered in a Monday night full of inclusive punk rock. A local rock act still in its infancy, MK Ultra impressed an already packed house and received praise from the bands that followed it. Next, The Spook School from Scotland got the crowd dancing hard to fast-paced pop-punk songs about body positivity and the transgender experience. The band had many dedicated fans in the room who sang and shouted along to every song. Great Grandpa brought a slower, more ominous sound in contrast. Their songs were emotional and sung passionately by lead singer Alex Minne, who sat on the floor on multiple occasions to further emphasize the band’s melancholy lyrics. Diet Cig’s bubbly energy seemed to be amplified in the small basement of the White Schoolhouse. Lead singer Alex Luciano jumped and kicked her way through the set with no fear of injury, despite tearing her ACL just months ago. Luciano told tour stories, spoke to fans and mingled with the crowd during a guitar solo, creating an even more intimate experience for the room.